The record is made up of 4 folios. It was created in 28 Mar 1854. It was written in English. The original is part of the British Library: India Office The department of the British Government to which the Government of India reported between 1858 and 1947. The successor to the Court of Directors. Records and Private Papers. 1. A letter (folio 347) from Lieutenant W Balfour, Commanding the Honourable Company’s steamer Acbar , to Kemball, dated 25 March 1854. Balfour’s letter is a report of the slave’s disappearance from his vessel. Balfour reports that the man is being held prisoner in a house in Bushire, and like most of the men of African origin in his crew, is most probably a runaway slave. 2. 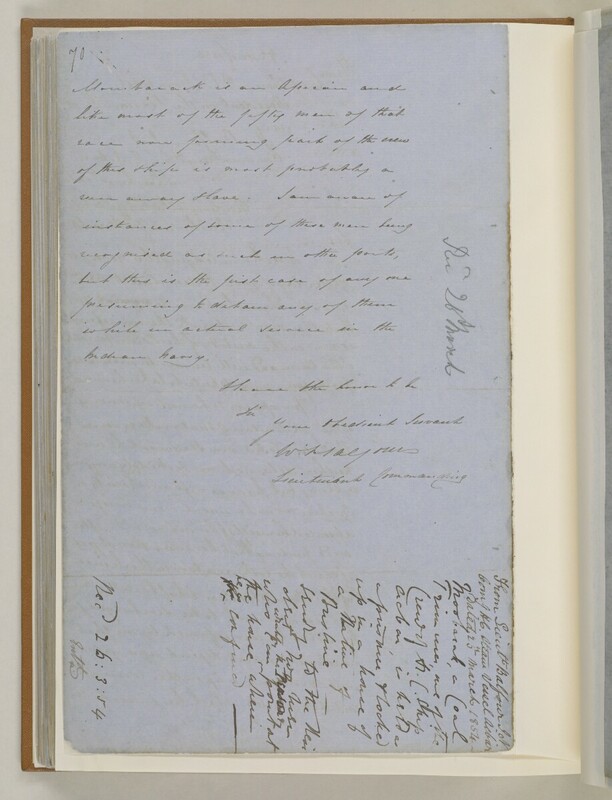 Letter no.100 of 1854 (folio 348) from Kemball to Balfour, dated 27 March 1854. Kemball writes that the runaway slave in question is now in the custody of the Police Master in Bushire, and will be made over to whatever party that Balfour wishes. Kemball also writes that the man was not imprisoned in Bushire, but had returned to his wife and child who resided in the town, and had expressed his wish to be discharged from the Acbar’s crew so that he could remain with his family.